Hello! If you are reading this, you’re probably into the hard task of finding the best vendors in Punta Cana for your Wedding Day. Some categories can be harder than expected, and we found that it was complicated for our brides to find a comprehensive list of makeup artists in town. Since you probably can’t meet your vendors in person, we recommend you to reach out to a few of them to find out which one you connect with. You’ll spend quite some time on your wedding day with your MUA, and it’s key that you are comfortable hanging out with her in the bridal suite. We worked with every single person on this list and they are all real, trustworthy people! They are skilled professionals, and you will be in good hands hiring any of them. Depending on where you get married, the resort might make your life easier -or harder- if you bring your own team of professionals to work with you. As vendors in Punta Cana, we have a few limitations because most of the resorts are slowly charging our couples more and more to allow us to work inside. This not only happens to photographers but to the makeup artists as well. They want to keep their business running and we get it. That’s why we have come up with a list of hotels and vendor fees, so you can know which hotels are charging more and which ones make it easier to choose your own staff to make your wedding day a special one. Some of us are in the constant search for improvement and offering a better service and unique products to avoid the “wedding factory” that you usually find in big hotels. We truly feel that each wedding is unique, and it shouldn’t feel like the next one. With these words, we don’t mean to say that people working inside resorts are not qualified to do their job, but without a doubt, you can find better services if you search online and read the reviews. As wedding photographers, we constantly work with makeup artists during the Getting Ready in each and every one of our weddings. A good makeup artist’s work will make our photos look professional, beautiful and with nicer skin tones. This is the reason why we would like to dedicate this space in our blog to the makeup artists that work in town. Although there are quite a few doing this kind of work we would like to concentrate on the ones that stand out from the crowd. Anna is a Spanish stylist, from Barcelona. 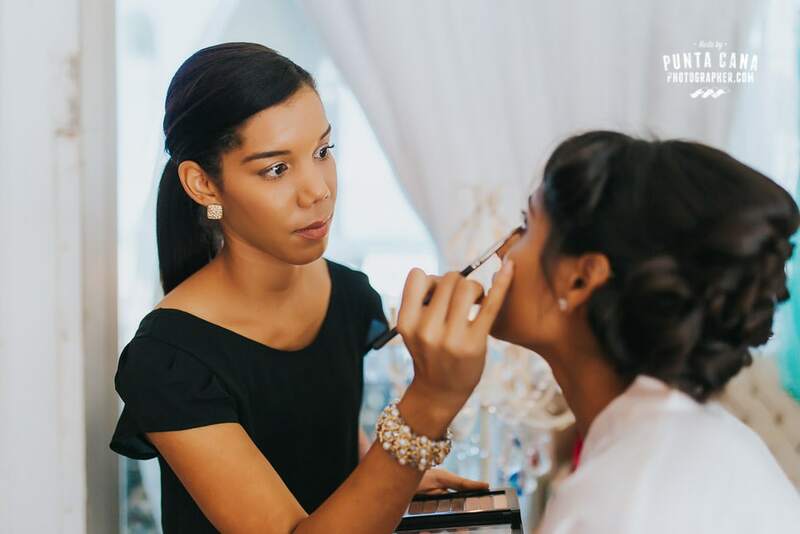 She is without a doubt one of the makeup artists with more experience in the Bavaro/Punta Cana area and her schedule is pretty busy, so if you are interested in contacting her it would be best if you plan the date beforehand. She has been working with bridal makeup in Punta Cana for many years, after working as a stylist in big brands in New York. Barbara Marie is a licensed cosmetologist from the USA who works as a bridal stylist here in Punta Cana. She’s been here for many years and we ran into each other many times, always with great results. Cristal Sepulveda is a Dominican makeup artist, originally from Santo Domingo but working in both Punta Cana and the capital city. 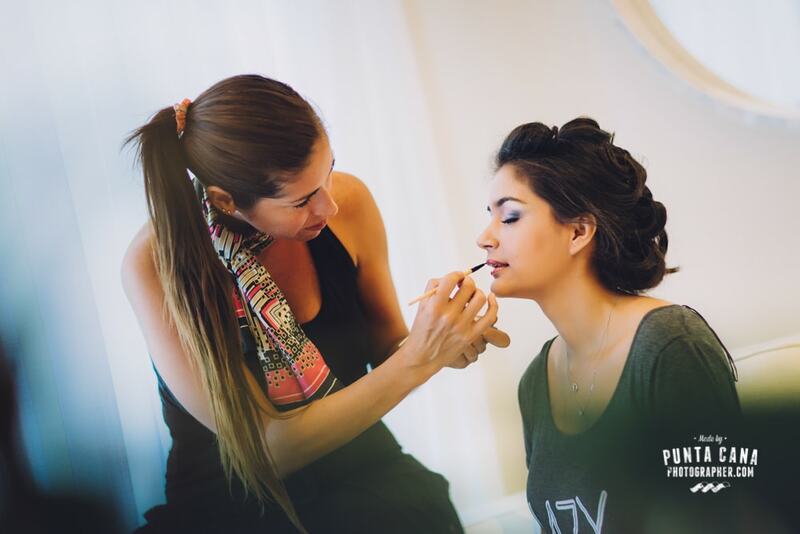 With more than 5 years of experience as a makeup artist, hair stylist, she has hundreds of happy and satisfied brides and she will make you feel and look your best. Indira has a unique style, which you can easily see in her Instagram account. She can do wonders with different skin tones and she’s in love with heavy eyeshadows and bold styles. She’s great to work with and even though she works mostly with local brides, you could fall in love with her talent and have her do your makeup too. Krystie Ann is a well-known makeup artist, also certified in styling. She has been in the bridal makeup business for years, and she shows it every time. She currently lives in Punta Cana and is dedicated to destination weddings full time, in which she can express her creativity every day. Krystie has more than 400 wedding makeups to show as experience, besides working in brands like Estee Lauder and Cargo Cosmetics. What we love about her: She makes our life EASY! She knows exactly what we need and it’s a joy to work alongside her in every event. Magda has over 15 years of experience in the makeup and beauty área, and she has worked with brands like Lancome, Christian Dior, and Helena Rubinstein. After arriving in Punta Cana in 2010 she focused her work as a photographer and worked as a makeup artist occasionally. A few years back, she started her own company, which successfully has grown in the Bavaro – Punta Cana area. 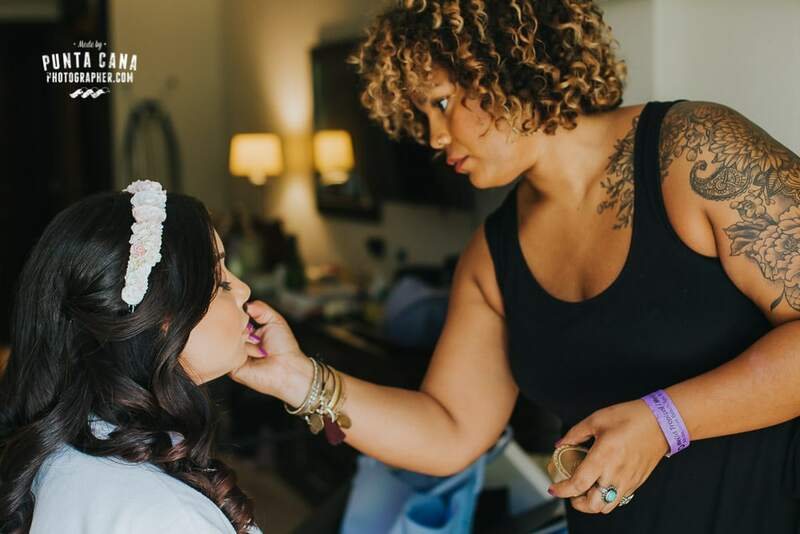 She is not only a makeup artist but also a cosmetologist, always following the latest trends and dedicating all of her effort and time to the world of weddings in Punta Cana. Melanie Gabriele is a Canadian makeup artist, based in Canada and currently traveling to DR for a few months of the year. She specializes in bridal makeup. If you want to find out more about her you can read our blog post! Olga Montilla is a professional stylist, makeup artist, wedding stylist, and fashion-hairdresser with a long-term experience. She is originally from Saint Petersburg but is now permanently based in the Dominican Republic. With great taste, amazing skills and the use of professional cosmetics, she is everything you could ask for in a makeup artist. 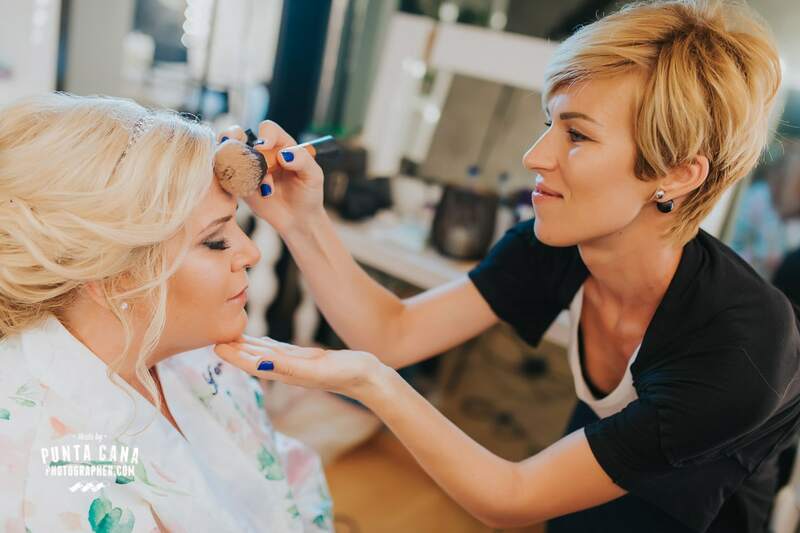 Although all of the makeup artists in the area have a great deal of experience, the selection you make for your wedding day will be according to the availability they have and the style that you are looking for. 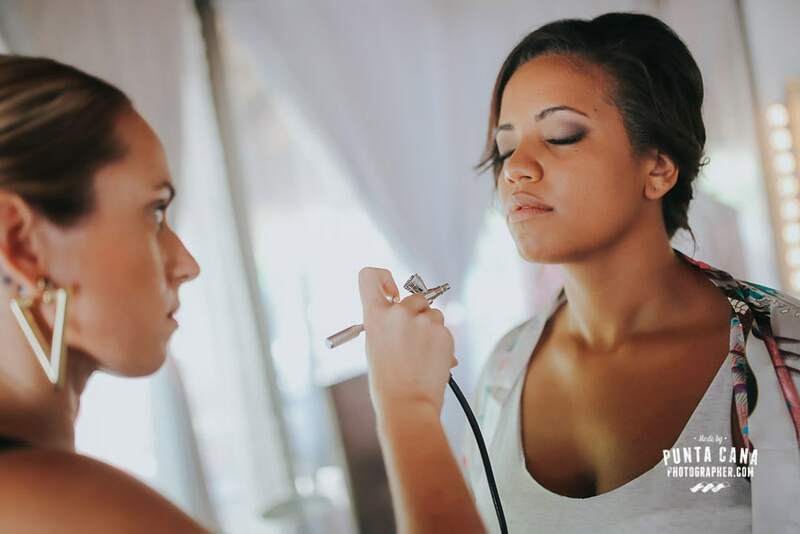 Resorts have makeup artists inside the SPA, but depending on the hotel you should find out if they are talented enough and if their job will be up to your standards to make you look stunning on your wedding day. You always have the possibility to do a trial a few days before your wedding. You can check these prices when you ask for the rest of the fees for your big day. 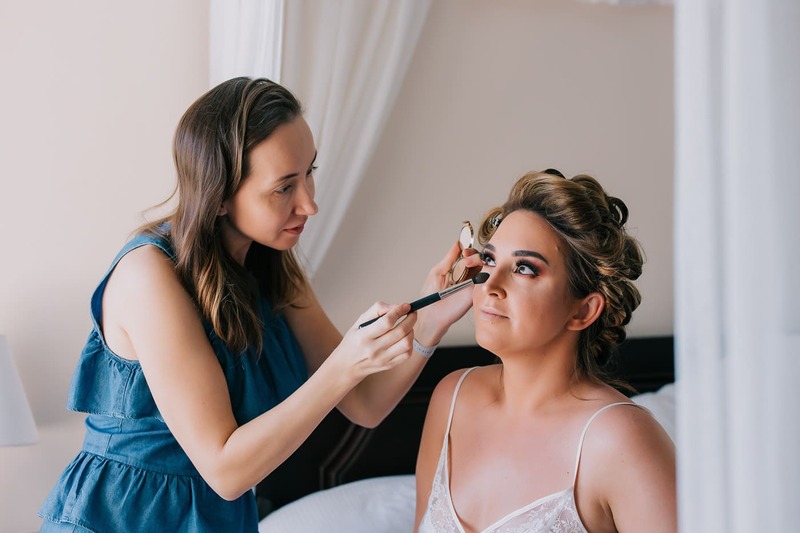 Most makeup artists have different rates for bride’s makeup and family members or bridesmaids, so if you have a large group coming with you can negotiate a rate for all of you. In some resorts, you will have to pay an extra fee to allow your makeup artists in, although most of the times a Day Pass will do, since the makeup artist will not be working on the beach on your wedding day as a photographer would. Photographers have to pay a vendor fee and it usually is more expensive. 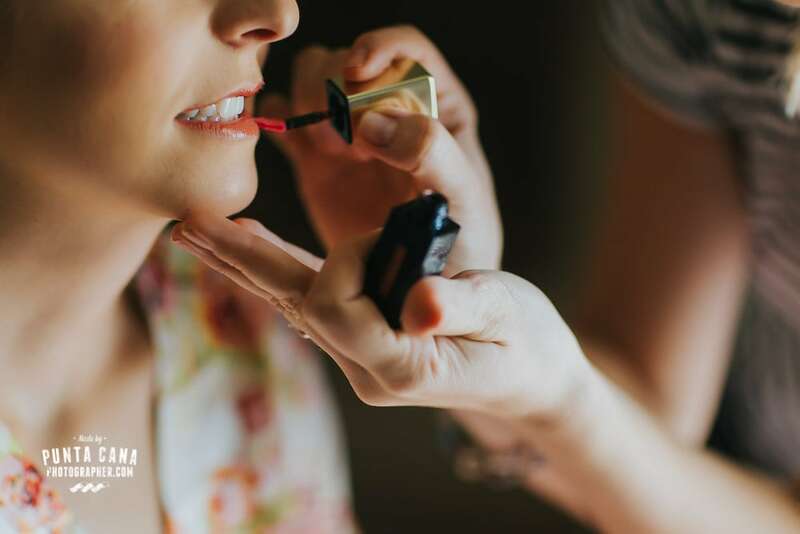 If you are not able to get your makeup artist into the resort with a day-pass, you can always book her a night inside the hotel if this option is cheaper than paying for the vendor’s fee. In this case, the makeup artist will be in your room working with you as if you had paid for her vendor fee to get into your room. We encourage you to get in touch with any of the makeup artists to have some more information and if you are unable to reach them you can talk to us and we will help you too. I hope you look as stunning as you have always imagined on your wedding day.